Eagle Mountain claims to have captured the perfect “neighborhood feel” in an urban location. 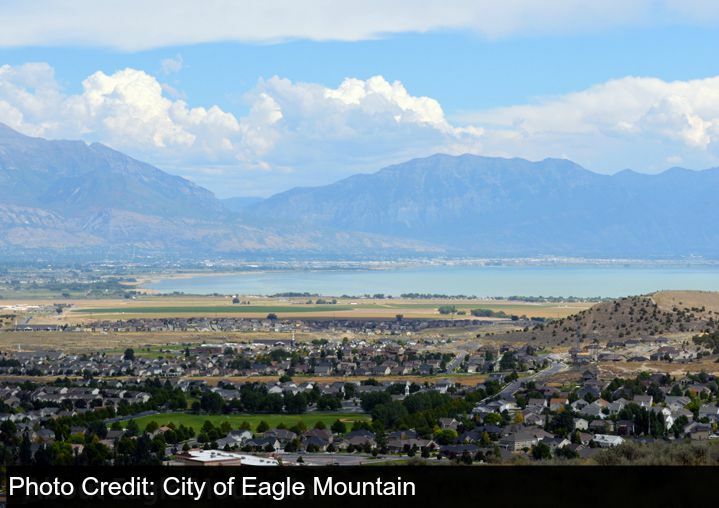 Located on the west side of Utah Lake, Eagle Mountain is the third largest city in Utah in terms of land area. This city was incorporated in 1996, and has grown from 250 residents to more than 25,000 since. The city boasts of quiet and safe neighborhoods with wide, open spaces and a strong sense of community. Eagle Mountain is home to the Historic Pony Express Museum as well as an annual Pony Express Days festival, as the actual trail ran through the city when in operation. Eagle Mountain is the first city in Utah to open a city park designed for mountain bikers. Mountain Ranch Bike Park attracts riders of all skill levels to try out various dirt jumps, a pump track, and other tracks. Elk Ridge is a beautiful hillside community located in the southeast portion of Utah County. This small town was incorporated in 1976 and then incorporated as a city in November of 2000. Elk Ridge offers an excellent selection of community parks, pavilions, and trails for family recreation. Though the city does not have its own sports program, Elk Ridge works closely with Salem to offer residents a wide variety of active and competitive fun. Call the city office at (801) 423-2300 to reserve pavilions. Lehi, located just west of the 1-15 freeway, near the point of the mountain, boasts of being a place “custom built for families.” Lehi is the northernmost community in the Utah Valley and was incorporated in 1852. The city’s slogan, “Lehi is a good place to live,” is backed up by safe communities, a growing economy, and endless recreation opportunities. Lehi has undergone an economic transformation in recent years, welcoming several large and high-tech companies such as Adobe Systems, Xactware, XanGo, and IM Flash Technologies. 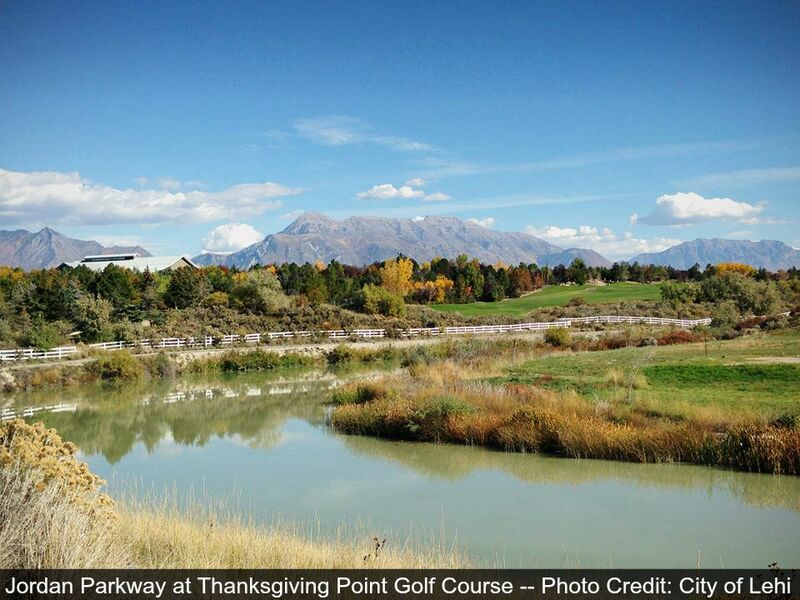 Lehi is also home to attractions like the renowned Thanksgiving Point and the Traverse Mountain Outlets. There is no shortage of things to see and do throughout all seasons of the year in Lehi! Lindon is located in northern Utah County, bordered by Pleasant Grove to the north and Orem to the south. This city was named after the Linden tree, and was incorporated in 1924. Lindon has a small-town feel while offering all of the amenities and services residents could need. In 2013, Lindon received a rank wihtin CNN Money Magazine’s “100 Best Small Cities to Live in America.” Lindon offers an abundance of city recreation as well as access to parks, trails, and other outdoor destinations. Lindon hosts an annual themed Lindon Days Fair in August as well. 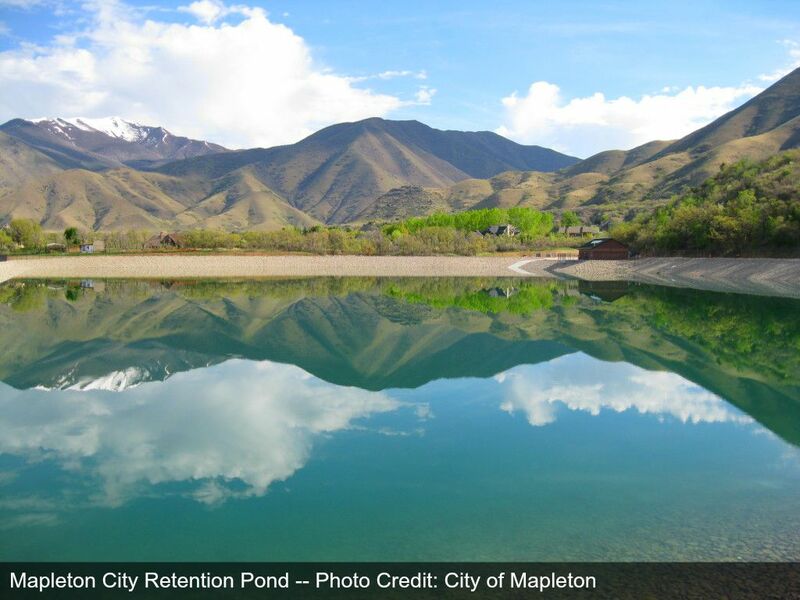 Mapleton is located between Hobble Creek and the Spanish Fork River. This city was officially incorporated in 1948, though it was used much earlier by settlers for farming and livestock. The Spanish Fork Peak sits in the center of Mapleton, and has been given the unofficial name of “Maple Mountain” by residents. Mapleton has preserved its rural, agricultural atmosphere, but has also experienced significant growth and development. Today residents enjoy the growing community, parks and recreation, and city events offered in Mapleton. Orem is located just north of Provo, and just east of Utah Lake. This city is considered by many to be the commercial capital of Central Utah and has been recognized for its fast-growing business sector. In recent years, Orem has become the fifth-largest city in Utah. Orem has much to offer, including Utah Valley University, a former community college that has risen in size and prestige. This university is one of the only Open Enrollment Universities in the United States. UVU is the fastest growing university in the state of Utah. The city is also home to minor league baseball team Orem Owlz and offers annual events like the Orem Summerfest and the Timpanogos Storytelling Festival. Top employers in Orem include Utah Valley University, Alpine School District, and TImpanogos Regional Hospital. Payson is located on the southeast end of Utah County. The city was founded in 1850, and incorporated just three years later in 1853. Today, Payson has a significant number of scottish descendants and hosts an annual Scottish Heritage Festival in July to celebrate this demographic. They also host annual Onion Days Festival in September. Payson memorializes its heritage through places like historic Main street and the Peteetneet Museum and Cultural Arts Center, which pays homage to the Ute Indians who previously occupied the land. Locals enjoy Payson for its abundant land and outdoor resources, which are frequently used for recreational shooting, ATVs, and hiking. Payson is also home to a beautiful mountain drive up to the picturesque Payson Lakes. Provo, the “heart of Utah County,” is located between the mountains and the east side of Utah Lake . This city is home to the prestigious private university, Brigham Young University. Though technically a “college town,” Provo has a vibrant variety of residents and a vast family life. Provo serves as a hub for a wide range of activities-- from performing arts to hiking. Provo River provides the perfect setting for tubing, kayaking, and fishing. The Provo Canyon has countless places to picnic, hike, and camp, and leads up the canyon to Robert Redford’s world-renowned Sundance Resort. Visitors to Provo enjoy strolling along its historic downtown, grabbing food at one of its countless food trucks, and touring the many free attractions offered at BYU. Provo also houses innovation in many forms-- Nu Skin is located in downtown Provo, and Provo is the second city to welcome Google Fiber. Provo was recently ranked the No. 1 Fastest-Growing Metro Area for Residents and riches by selfstorage.com. 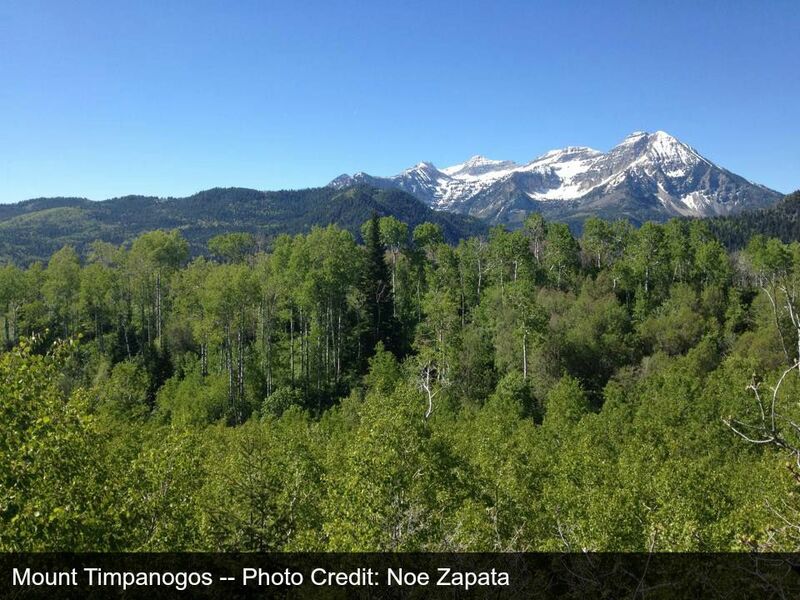 Pleasant Grove, also called the “City of Trees” is situated between American Fork and Lindon. This city was originally called Battle Creek by Mormon Settlers, but later changed to Pleasant Grove and incorporated in 1855. Pleasant Grove is well known for Utah’s longest continuing community celebration, called Strawberry Days. This summer festival includes a rodeo, parades, a carnival, a variety of other activities. Pleasant Grove is also known for its attractions like the interactive and educational Christa McAuliffe Space Education Center, the seasonal activities at Hee Haw’s Farm, and the gorgeous LDS Mount TImpanogos Temple. 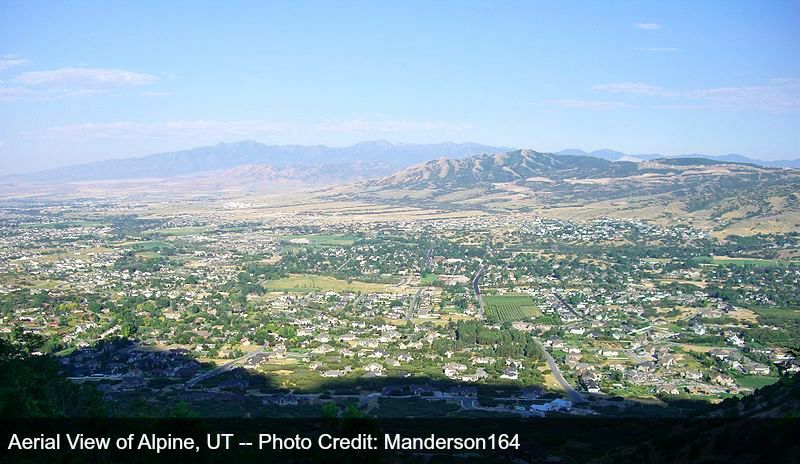 Alpine City is nestled at the base of the Wasatch Mountain Range on the northern border of Utah County. This quaint town received its name in 1850 because the town reminded Latter-day Saint prophet Brigham Young of the Swiss Alps. Though this city has farming roots, it also boasts technological advancement and economic development in the past years. Alpine is known for it’s scenic drive through the Alpine Loop, as well as some great hiking trails like Horsetail Falls. The city of Salem sits at the southeast end of Utah County. Salem was known as “Summer Spring” by the native tribes in the area, and later known as “Pond Town” by early settlers. It finally received its name of “Salem” in the 1850’s and was incorporated in 1920. Salem has several citywide events for guests to enjoy, including Pond Town Christmas and the Miss Salem pagaent. Their biggest event is the annual Salem Days, which takes place in August and includes concerts, contests, car shows, parades, fun runs, movies, a rodeo, and other activities. Santaquin is located on the southeast side of Utah County, just south of Salem. This city was first settled in late 1851 and was named after the son of the friendly local Indian Chief Guffich. The city is known for it’s abundant agriculture, particularly in fruit farming. It is recognized as the Utah Farming Heritage District. One jewel of Santaquin is “The Red Barn,” which houses fresh produce, handmade donuts, and hand-churned ice cream, as well as seasonal activities throughout the year. Santaquin Canyon, Nebo National Scenic Byway, and the Mona Reservoir provide guests with ample resources for outdoor activities like hiking, rock climbing, swimming, and camping. Saratoga Springs is a young city located near the northwestern shores of Utah Lake. Before becoming a city, it’s natural hot springs were used as a resort called Beck’s Saratoga Springs in the late 1800s. In the late 1900s, locals began to develop the land surrounding these hot springs. Saratoga Springs was recognized as a city in May of 2001. It has experienced significant and rapid population growth since its establishment. The city boasts of its scenic access to the Wasatch Front and Utah Lake. It has a variety of community events available to families in the community, such as its annual Saratoga Splash Days City Celebration in June. Spanish Fork is located in the south central portion of Utah County. The city includes the lowlands near Utah Lake and the foothills of the Wasatch Mountains in the southeast. Spanish Fork is well known for its Spanish Fork Fiesta Days and Fiesta Days Rodeo, which have been running for over 70 years. This event features top cowboys and wranglers competing in rodeo events, as well as other concerts, contests, games, and parades. Spanish Fork is unique in that it hosts the only Hindu center in Utah County-- the Sri Sri Radha Krishna Temple. This temple hosts a holi celebration which thousands of people from across the country flock to each year. Springville is a small community in the Wasatch foothills, bordering the south end of Provo. 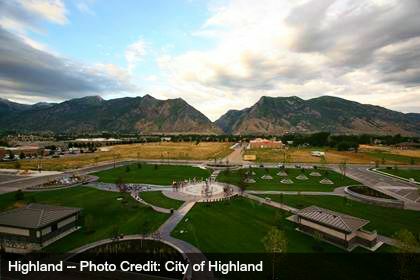 This city, originally known as Hobble Creek, was incorporated in 1853. Springville has experienced steady growth of 4.6% annually over the past ten years. Because of its heavy city-wide focus on the arts, it has been nicknamed “the art city.” Springville is known for its art museum and its downtown area, as well as events like the Springville World Folkfest and the Indian Festival of Utah. Springville hosts Art City Days each year in the month of June. The festivities include parades, a carnival, hot air balloons, rodeos, and fireworks. Woodland Hills, located on the southeast portion of Utah County, became a city in 2000. This young city has grown…. It takes pride in its gorgeous views of the mountains and the valley, and its abundance of wildlife. Perhaps what this city is most known for is their unique annual city-wide event, the Woodland Hills Yeti Extreme Games. This event allows participants three options: a 5k-foot race, a 5 mile bike race, or a combination of running, cycling, and snowshoeing up Loafer Mountain. In the past, this event has attracted local businesses and organizations to participate together and compete for first place. Often times, attendees will dress up in Yeti costumes. American Fork City, lovingly called “A.F.” by Utah County residents, sits at the foot of Mount Timpanogos. This beautiful city was first settled by Mormon pioneers in 1850 and named American Fork after the American Fork River in 1860. American Fork residents take pride in capturing the “Spirit of America” with a duality of small-town charm and booming business. Guests can enjoy the city’s extensive recreation center and pool perfect for families or participate in some of A.F’s traditional events like its “Steel Days” festival in early July. And don’t miss the opportunity to venture up the magnificent AF Canyon-- perfect for bonfires, hiking, and camping. Cedar Hills, the 'trailhead to adventure' in northern Utah County, is located near the mouth of American Fork Canyon. The city provides residents and guests easy access to a wide array of great outdoor adventure and exploration, including treasures like Timpanogos Cave National Monument and Tibble Fork Reservoir. Cedar Hills offers an extensive pedestrian trail system, which links many community parks and open spaces, including the cedar hills Golf Club, an 18-hole championship golf course that sits on a ridge overlooking the surrounding valley. Cedar Hills was incorporated in 1977 and has experienced significant growth in both population and business since 2003. For more information, contact the city's front desk at (801) 785-9668, ext 100, or visit cedarhills.org. 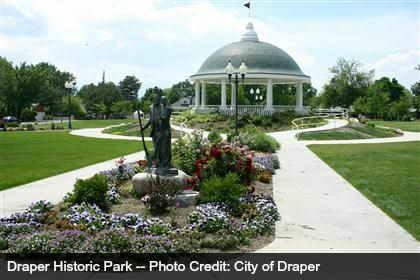 Draper is situated on the north end of Utah County, bordering with the Salt Lake Valley. This city, formerly known as Draperville, was established in the 1850’s. Now, this city serves as a hub for activity and exploration. Located at the “point of the mountain,” Draper offers hang gliding and paragliding to adventurers at one of the largest and most well-known hang gliding schools in the nation. This city offers guests over 90 miles of gorgeous trails for cycling, hiking, and exploring. Draper is also home to Utah’s first IKEA and to the new and exciting Loveland Living Planet Aquarium.